Rising from the Arabian Gulf on an island 280 metres from the shores of the renowned Jumeirah beach and designed to resemble the graceful sails of an Arabian dhow, Burj Al Arab soars to a height of 321 metres, dominating Dubai's coastline. 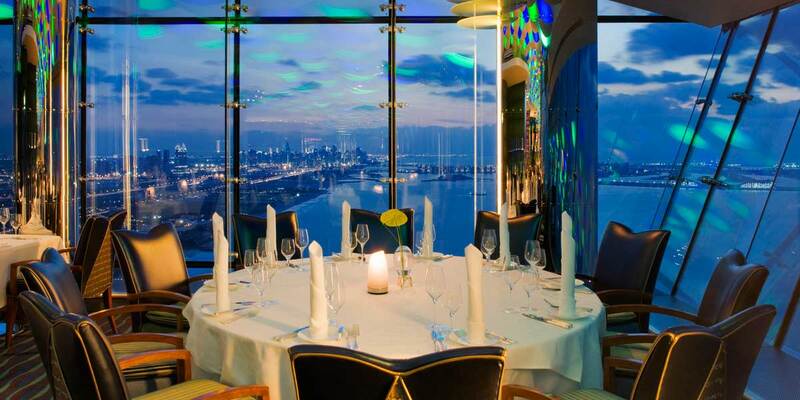 Burj Al Arab has been recognised as one of the finest hotels in the world and offers the ultimate in luxury accommodation. 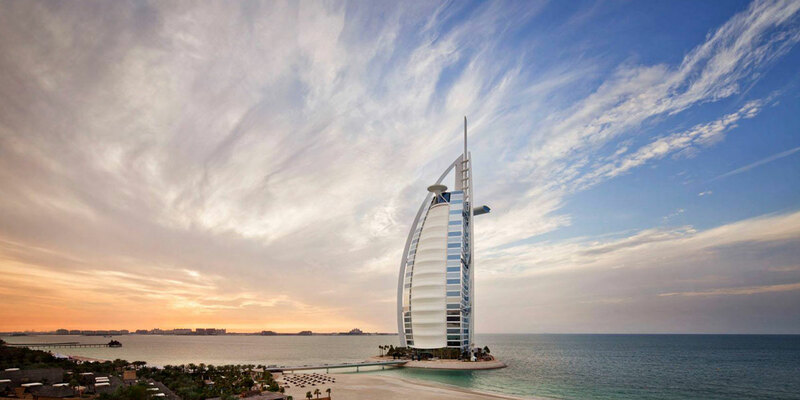 Already a world landmark, the Burj Al Arab silhouette defines Dubai. The interior design of the hotel is evocative of a contemporary Arabian fantasy. 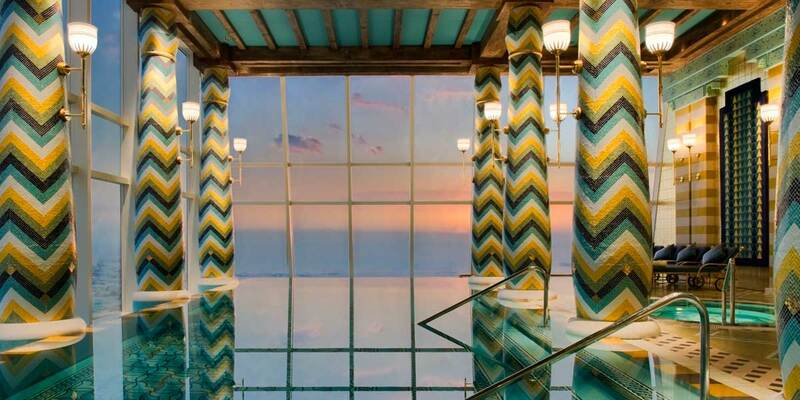 Exclusive events deserve an exclusive address. 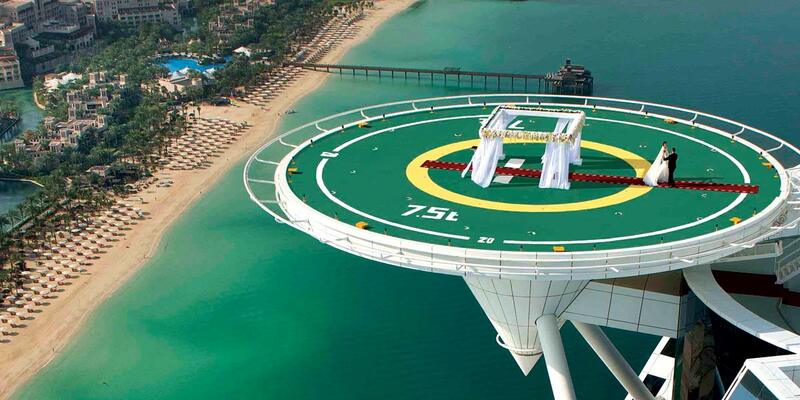 Inspiring and innovative, The Burj Al Arab, Dubai event spaces are fitted with the latest technology and state of the art facilities, making any event a memorable one. Designed to accommodate a wide range of celebrations, from weddings, to corporate and social events, indoors and out, a dedicated team and the perfect venue will ensure event perfection. The magnificent lobby is sumptuously carpeted in a rich combination of vibrant colours and lavish materials. 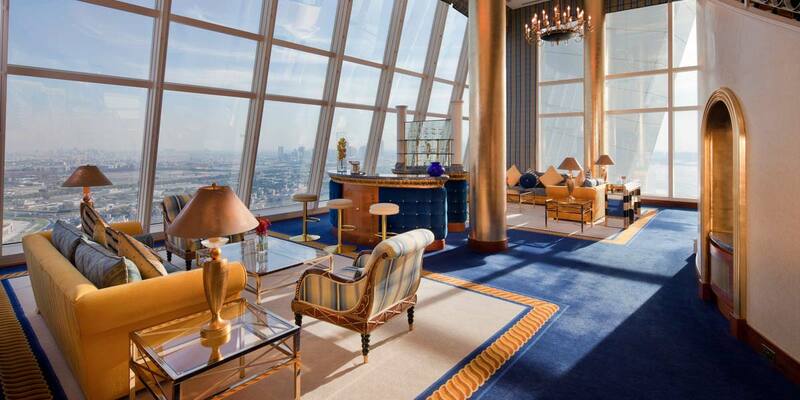 With beautiful views of the Arabian Gulf some rooms feature spiral staircases that lead from one floor to the next. The Club Suite with its spectacular views of both sea and desert and its unique recreation facilities make it an ideal venue for both corporate and private entertainment. 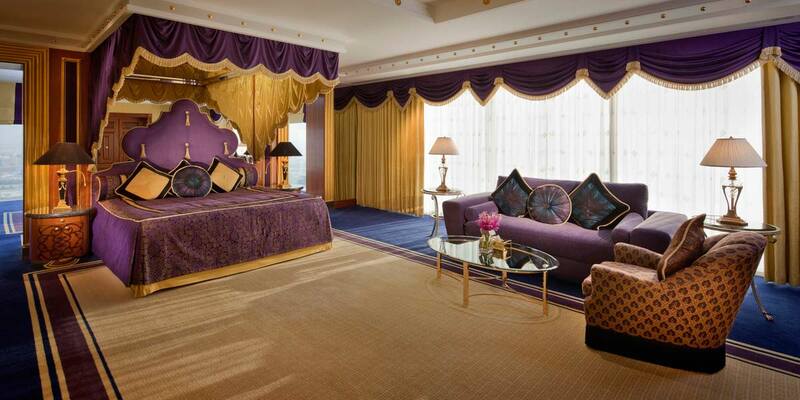 The stately and opulent 2 bedroom Royal Suite on the 25th floor is the last word in luxury, with its lavishly appointed interiors, majestic colour scheme and sumptuous furnishings. 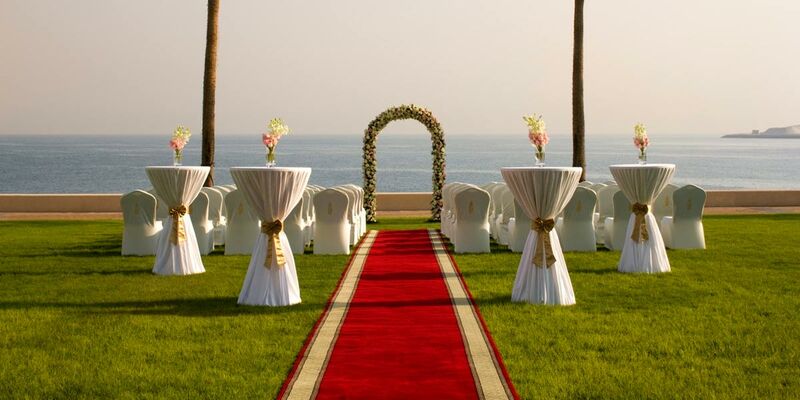 Immaculate service in sensational settings, ensures a winning combination for large or small events. The breathtaking venues and delectable catering combine to create perfectly executed, bespoke events at the world’s most luxurious hotel. 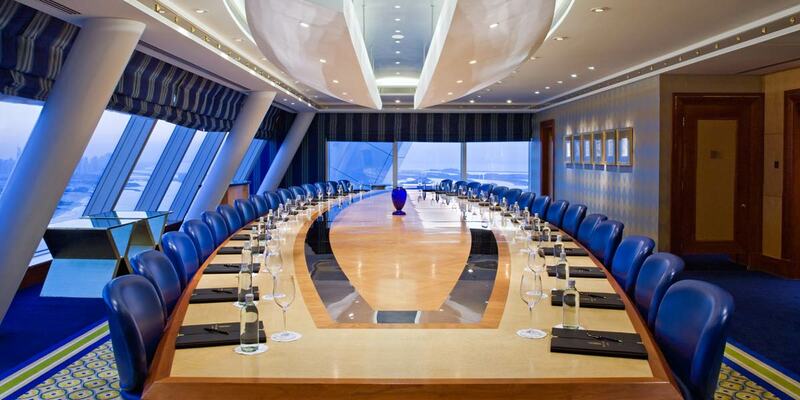 For high profile corporate clients, the 27th floor boasts five distinctive, purpose-built boardrooms. 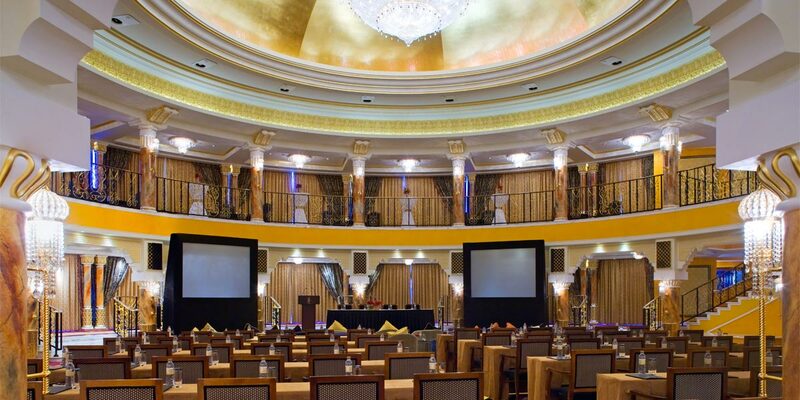 For larger conferences, the superior, uniquely circular ballroom creates an opulent setting with natural daylight and dazzling crystal chandeliers. 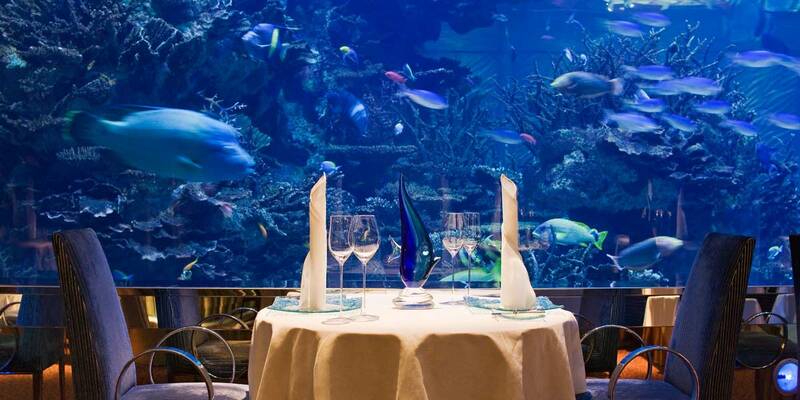 When it comes to dining there are no fewer than 7 restaurants and bars to choose from. Al Mahara restaurant is poised 200 metres above sea level, Al Muntaha features 12 live cooking stations and 45 specialized Asian chefs, Skyview Bar offers the finest selection of rare spirits and fine wines while Sahn Eddar provides the perfect backdrop to enjoy morning coffee or afternoon tea. Bab Al Yam is located amidst lush landscaped gardens and alongside Burj Al Arab’s private sundeck. Ultimately, The choice is yours.